Nestled away on San Martin street, not far from the bustle of Florida Street, lies the refreshingly eclectic Dadá, a nice option for a drink or a meal in the downtown area. Dadá’s smallish interior could be described as slightly cluttered and worn, but it is certainly not a dive bar. Nor could it be called pretentiously chic, although the walls are adorned with Lichtenstein Pop Art and French, British and American pop culture references. The mishmash of styles that Dadá emits gives it a rather personal and intimate feel. You get the impression that owner Paulo Orcorchuk, and his younger brother Mateo, both a constant presence behind the bar, have set the place up according to nothing more than their own tastes and fancies, giving it an air of effortless cool. 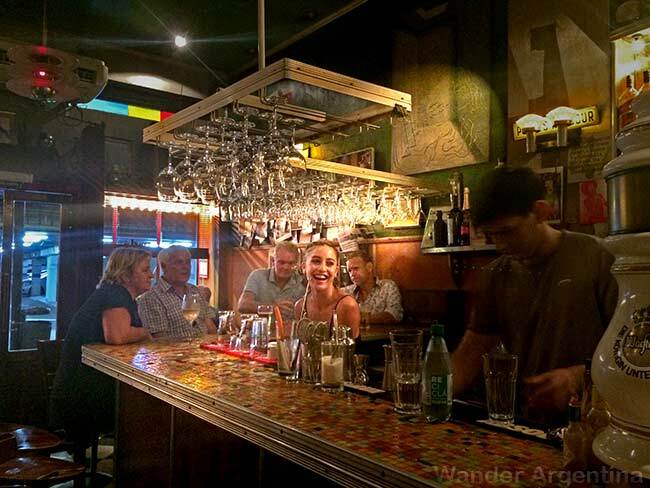 In truth, however, the layout was conceived by renowned Porteño bar and restaurant designer and Dadá co-owner Mario Salcedo. The music at Dadá is mercurial; you can hear anything from reggae to laid-back dance music to Sinatra, depending on the guys’ mood. Seating is limited to several stools at the bar, and about a dozen small tables and booths, meaning that with only a handful of customers, the place feels quite full and can be crowded at peak hours. The bar features a decent selection of spirits, cocktails and a good wine list. The food is surprisingly excellent for a spot that feels more like a bar than a restaurant. Although the ‘international’ menu is not extensive, a nice variety of dishes offers something different from the usual downtown cafe/resto fare. Highlights include the Lomo Dadá and Lomo Mediteraneo steaks and some superb appetizers that will almost fill you up on their own, such as the polenta, and the hummus with warm Turkish bread. Quality comes at a price, unfortunately, and dishes are a little more expensive than your average bar cuisine. Despite this, most patrons find it very hard to resist having a bite to eat to accompany their drinks once they see the delicious creations being wheeled out of the kitchen. Dadá is the kind of place that will impress a date, but can also fun with a group of friends, or just to have a drink at the bar. • Hours: Monday to Saturday; Midday – 3a.m.